Enjoy a safe and abundant harvest by using these natural products. 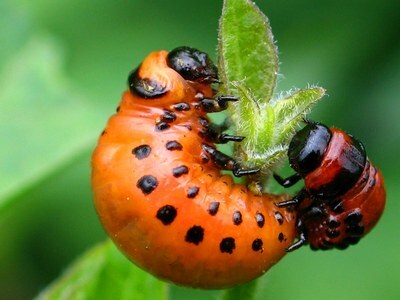 Colorado potato beetle larvae and other pests are gorging themselves on our crops. Safe and natural insecticides can protect our harvest. What do bugs and gardeners share in common? We both love to eat vegetables. The harvest has begun and pests are threatening our crops. When we see bugs in the garden, our first inclination is to apply an insecticide. This makes sense, but nobody enjoys eating veggies treated with poisonous chemicals. It’s good to know that insecticides are now available that are effective, natural and practically non-toxic. Organic growers have used Bacillus thuringiensis var. kurstaki for decades (tradenames include Dipel and Thuricide). It kills harmful caterpillars including earworms and cabbage worms but does not harm other types of insects. For example, it will not harm honey bees and lady beetles. That’s great! Neem oil, derived from a tree inAsia, has been used to control insect pests for thousands of years. Neem oil controls almost all insect pests in the garden (Table 1). Its chemical azadirachtin repels insects and reduces their ability to feed. It disrupts the hormones of insects, preventing them from reproducing. Effectiveness and toxicity of natural pesticides and synthetic carbaryl in home vegetable production. Spinosad was discovered from soil in a Caribbean rum distillery. It is widely used today to control Colorado potato beetle (see photo). Spinosad can kill on contact but works best when it is eaten by an insect pest. If you are looking for a quick kill, pyrethrin is an option. Derived from chrysanthemums, it acts as a nerve poison. 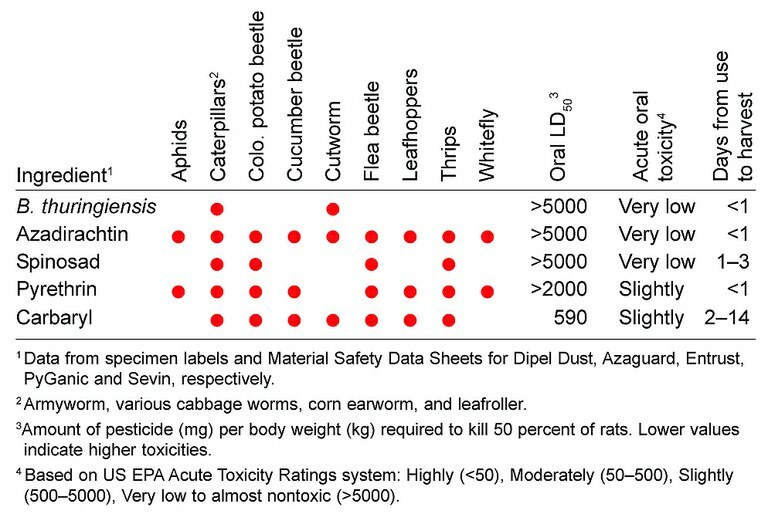 Pyrethrin is effective against many insect pests (Table 1). All of these natural products have low toxicities to humans (Table 1). These products have very short lives in the environment. On the plus side, this reduces the likelihood of killing beneficial insects and allows applications the day before harvest in some cases. On the negative side, they may require repeated applications to kill emerging pests. Most natural products act slowly and are most effective when pests are young. This requires more skill and attention on our part. We need to identify pests and spray plants promptly. The bottom line is we have natural choices to fight insect pests in our garden. Read pesticide labels carefully and follow directions. Used properly, we can protect our crops and enjoy a safe, abundant harvest. Written by Tom Kalb, Extension Horticulturist, North Dakota State University. Published in the NDSU Yard & Garden Report, July 29, 2016. Source: Johnny's Selected Seeds. 2016 Catalog. Albion, Maine. The photo was made available under a Creative Commons license specified by the photographer: imarsman.